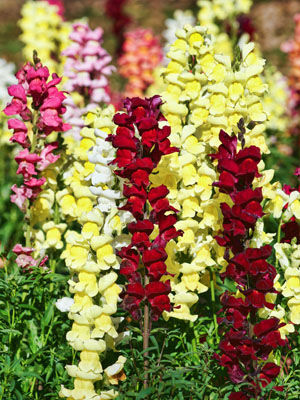 Upright and uniform, snapdragons make great accent plants when grown in groups. Try a snapdragon as the upright element in a mixed container. Some varieties can grow tall enough to need staking. Colours include red, orange, yellow, violet, white, pink and many bicolours. Snapdragons make wonderful cut flowers. Gather stems when two-thirds of the flowers on the spike have opened. As flowers fade outdoors, snip them off with secateurs to encourage reblooming.